WAVE© is a managed service offering from Motorola Solutions Inc. WAVE provides the ability to integrate WAVE Thin Clients such as Mobile Communicators with supported Motorola Solutions Inc. radio systems. This services allows Push-to-Talk communication between your radio users and anyone with a supported smartphone or PC and a valid account. WAVE services may be purchased with or without radio integration. When operated without a radio system, WAVE provides anywhere anytime communication between all connected WAVE devices. As long as your device has an Internet connection you can communicate with other users from any global location. When used with a supported MOTOTRBO radio systems, WAVE provides the capability to communicate with radio systems over selected Talkgroups using Push-to-Talk. All ‘Broadband Only’ features are included. Location mapping and text messaging is not currently enabled between Broadband clients and radio systems. If a radio system becomes disconnected, WAVE communication will continue to operate separately. Radio integration requires a WAVE Gateway. A Motorola WAVE Partner will install and configure the WAVE Gateway. The WAVE Wireless Service is a broadband solution that provides unlimited nationwide PTT, Group call/private call, location tracking, remote device management, over-the-air device management, and includes WAVE Two-Way Radio TLK 100 devices. This solution provides the WAVE Wireless Service (as describe above) with the addition of a WAVE Gateway for the integration of MOTOTRBO radio systems. Location mapping and text messaging is not currently enabled between Broadband clients and radio systems. If a radio system becomes disconnected, WAVE communication will continue to operate separately. Accounts are configured and maintained by a WAVE Partner or Partner Employee. Billing is determined by the number of licenses assigned to the Customer. The WAVE interface is separated into multiple component modules that connect with each other to form a Broadband-only or Broadband + Radio System Customer. The following diagram illustrates the basic connections. 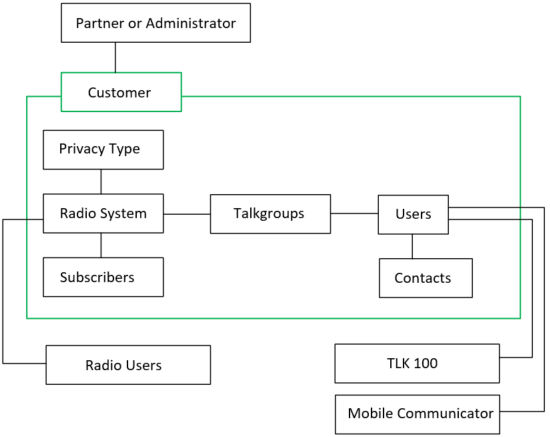 As you can see from the diagram, the majority of the modules to be added and modified are encapsulated within the Customer (green line). It is the Partner’s task to create Customers and Administrators. It is the Administrator’s task to create and manage Users, Talkgroups, and Radio Systems. For a better understanding of Partners, Administrators, Customers, and Users see Understanding the WAVE Hierarchy. Vous ne trouvez pas la réponse que vous cherchez? Ne vous inquiétez pas, nous sommes là pour vous aider! MOTOROLA, MOTO, MOTOROLA SOLUTIONS et le logo M stylisé sont des marques commerciales ou des marques déposées de Motorola Trademark Holdings, LLC et sont utilisées sous licence. Toutes les autres marques sont la propriété de leurs propriétaires respectifs. © 2017 Motorola Solutions, Inc. Tous droits réservés.